If you’re here, you’re probably looking for braided hairstyle inspiration for women’s hair. It can be hard to decide which type of braids to go with when doing up your hair for a big occasion. French braids is a viable option and a popular braided style for sure. Below is a collection of excellent photo examples. Barbara Palvin looking so fresh with this youthful french braids and face-framing, medium-length curls. This was her look at the the 73rd Venice Film Festival 2016. Medium-length, natural hair with red highlights styled with tight braids on the side for that creative finish. Highlighted, coily hair incorporated with three tight french braids at the side. 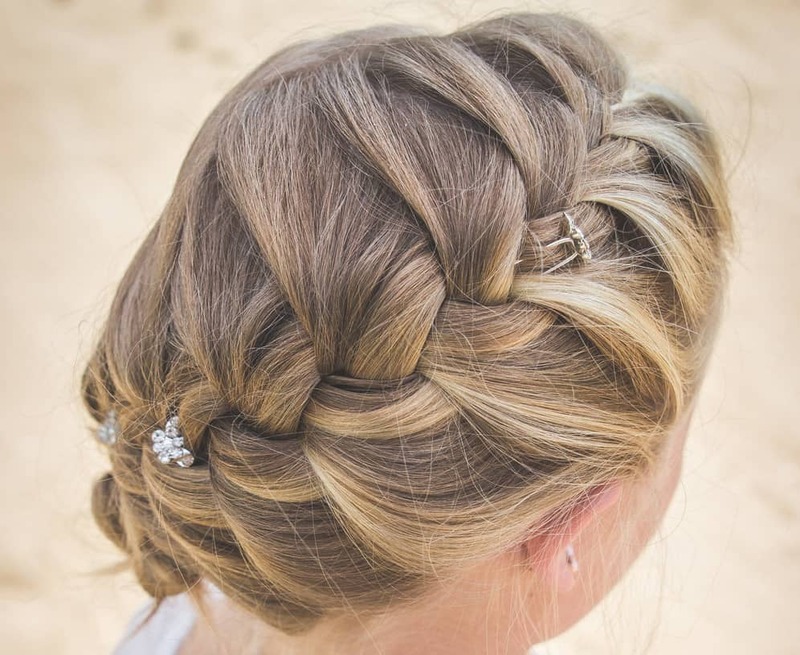 This hairstyle might look common but observing each and every detail makes it more appealing. Miranda Kerr looking fierce and sassy at the same time with her braided upstyle during the Manus x Machina Fashion in an Age of Technology Costume Institute Gala at the Metropolitan Museum of Art, May 2, 2016. Look divine with this timeless upstyle. Braided crown emphasizes more of your facial features, so be sure to try this one if your cheekbones are on fleek. Double buns braided tightly for that neat finish. This hairstyle promotes not just style, but also protection and comfort. A festive blonde pixie perfect for Coachella. This hairstyle is made up of several types of braids like three-stand, rope and french. A blonde pixie cut parted in a zigzag manner. The sections of the hair are braided into the sides, away from the face. A french braid for quick fix on your short haircut, totally rocks! Create a different look on your pixie cut with this one. Long and thin, Platinum Blonde hair styled in a top knot with a french braid. This hairdo is so easy, you can finish it in 5 minutes! A little trendiness during workout won't hurt. Try this double cute macaron buns with french braids. This one looks for darker hair. This young woman styled her half-up, top-knot with two gorgeous french braids. The overall look is playful and creative. The lady has straight hair highlighted with some blonde tones. Her hair is arranged into a reversed french braid starting from the bottom on the way to the top, creating a tight, high bun. Long, straight hair in a denim, dirtly blue ombre styled with a french braid on one side. This hairstyle might give you a grunge look, but it surely is glamorouos! If you wanna combine a grunge look with a classic one, try this braided ponytail with undercut. The side french braid gives a hint of sweetness to the edgy undercut. The ponytail is slightly teased for texture and volume. Cool-toned granny hair in a french braid. Long and thick hair dyed with this shade evokes an ice princess charisma. Truly enchanting and magical! Wavy blonde hair styled with a french braid on top, gradually forming into a classic ponytail. Chunky and slanted french braid and a classic bun recommended for women with long and straight, thick hair.